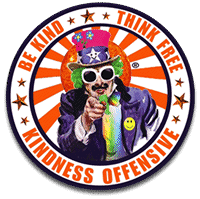 The Kindness Offensive is a project where the aim is to have fun, be kind and inspire as many people as possible to do the same. Performing both small and large scale "Random Acts of Kindness" is what these guys do, working together with so many kind of volunteers, companies and charities to make so many people happy. David Goodfellow and his housemates are spontaneous do-gooders who go by the name “The Kindness Offensive”. They specialise in meting out random acts of charity to unsuspecting members of the public. Their first successful “kindness act” was to persuade Yamaha to donate a red guitar to a boy who they knew wanted one. They have since followed that up by sending someone to see the Moscow State Circus, fulfilling another person’s dream of seeing a match at Wembley and, in October, they distributed more than 25 tonnes of food to destitute asylum-seekers. The Love Police : Everything is OK Guys ! Smiles & Free Hugs : Change The World ! Earth Hour 2010 : Shining The Light Within !